The booming growth of smartphone and Internet penetration across the country has stimulated a plethora of IT-based solutions pervasive in our everyday lives. It seems like everything we need is only one click away, from restaurant recommendations to a last-minute ride to the office. Yet at the same time, there is still an urgency for solutions that address challenges in low-resource communities, particularly in urban areas. Often living in densely-packed neighborhoods with inadequate living conditions, the urban poor are particularly vulnerable to health issues such as tuberculosis and dengue and face higher risks of evictions due to infrastructure developments as well as disasters such as flooding and fire. To overcome these issues, many organizations and companies have been developing and promoting IT-based products and services to find smart solutions in their respective fields. So far, many of these online platforms have proven to be effective tools in addressing the challenges, supporting efforts to build the resilience of these poorer urban communities. 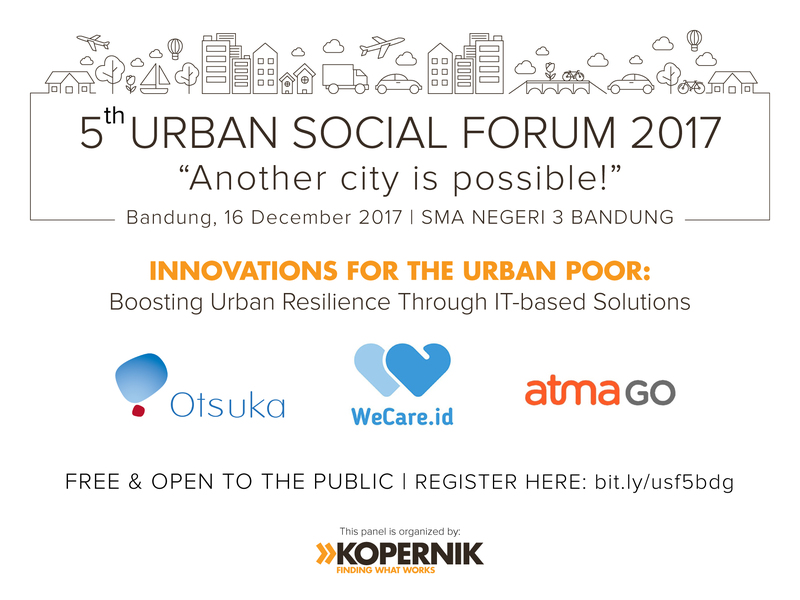 Aiming to stimulate this discourse further, Kopernik will host a session on ‘Innovations for the Urban Poor: Boosting Urban Resilience through IT-Based Solutions’ at the 5th Urban Social Forum in Bandung, West Java on December 16. Yoesrianto Tahir, Business and Scientific Development Manager for the TB project of Otsuka Pharmaceutical, a Japanese pharmaceutical firm that recently developed a smartphone app to support tuberculosis patients called Sembuh app. Gigih Septianto, Founder of WeCare.id, a medical expense crowdfunding platform for low-income households. Alfan Rodhi Kasdar, Field Director of AtmaGo, a neighborhood-level social network app for problem-solving within communities - responding disasters, improving access to basic needs, and overcoming chronic challenges. Each of these speakers will share first-hand experiences in developing and testing IT-based solutions that improve the access of critical services for the urban poor, ranging from medical to civic engagement. In this discussion, we will explore how we can better understand the needs and challenges of implementing IT-based solutions for the urban poor and how, ultimately, we can utilize them to improve resilience at individual and community levels.